From VOA Learning English, welcome to As It Is. I’m Steve Ember in Washington. Today we tell about how continuing disputes between protesters and government supporters in Thailand may affect the country’s travel industry. Then we turn to Pakistan to hear about a film that has brought new life to the country’s movie industry. But critics say it may add to existing tensions with Pakistan’s neighbor, India. Our first stop today is Thailand’s capital, Bangkok. Business groups are raising concerns about recent protests in the city. They say the political tensions could cause harm to the economy. VOA’s reporter in Bangkok says Thailand’s travel industry is already feeling the effects of the unrest – just before the normally busy Christmas holiday season. Thailand’s banks and business groups are calling on protesters and Thai government supporters to stop demonstrating and negotiate a settlement. Some business organizations are even offering to negotiate to avoid possible long-term economic damage. The credit ratings agency Moody’s Investor Service agrees that investments could suffer if the tensions continue. Thailand’s economic growth has decreased to less than three percent from better than five percent earlier. A World Bank report said a lack of export growth slowed the economy. Business and capital spending have slowed. And, industry studies show that businesses have growing negative feelings about the country’s financial climate. Supavud Saicheua is managing director of the investment house Phatra Securities. He says foreigners are being more careful about investing in Thailand. The more cautious climate began when Parliament’s lower house passed an amended amnesty bill. The measure could have let former Prime Minister Thaksin Shinawatra return from exile and not face jail for corruption. Thaksin Shinawatra is the older brother of current Prime Minister Yingluck Shinawatra. He was ousted from power in 2006. The measure did not go forward. But that fact has not done much to reduce street gatherings and clashes. Chris Baker is a writer and commentator on Thai politics. Mr. Baker says important business investors from Japan and Korea are less worried by the protests. But, he says that even so, the political conflict in Thailand over the last eight years could have an overall effect on investors’ behavior. In recent weeks, about 30 countries have warned their citizens to be careful about traveling to Thailand. Usually, two million visitors arrive each month. But the travel industry is estimating that about 10 percent of those visitors will cancel their plans. Thai travel industry operator Luzi Matzig is chief executive officer of Asian Trails Group. He says travel warnings hurt the tourism industry, but so far the effect on the visitor industry is still not major. But if the demonstrations continue, Mr. Matzig says the travel industry could lose 15 to 20 percent of business next year. It’s As It Is, coming to you from VOA Learning English. I’m Steve Ember. Now we go to Pakistan, where many people are crowding theaters to see a new movie. The Pakistani film industry has had few really successful movies in recent years. But the movie “Waar”, or “Attack”, has changed that. It has earned the most money in ticket sales ever for a Pakistani film. Christopher Cruise tells us more. The movie tells the story of a former military hero who saves Pakistan. Critics say the movie suggests India is the enemy. And they say that suggestion deepens the tensions between Pakistan and its neighbor. Still, some people praise the film because it is based on true situations in Pakistan -- like the fight against terrorism. At least, that is the opinion of Nawab Hassan Siddique, who made the film available to theaters. Indian dance films are popular in Pakistan. But the Pakistani film “Waar” is different. Its hero is Major Mujtaba, a former member of the country’s special forces. It shows questioning of suspects with lots of blood. “Waar” never shows where the enemy is from. But many moviegoers are sure they are from India. And that has caused criticism. Military expert Ayeesha Siddiqa says what some people believe is material condemning India is not helpful. She says that is true because relations between the two countries are already tense. Hassan Waqas Rana wrote and produced the film. He says he wanted it to start people talking. Mr. Rana dismisses suggestions that Pakistan’s powerful military helped pay for the film. He admits the army helped with suggestions about military actions and planning to make the film more realistic. But he says he wrote and financed the movie himself. The great success of “Waar” has led to ten other films being made in Pakistan. And I’m Steve Ember. You are listening to As It Is from VOA Learning English. Emily Dickinson, a prolific19th century writer, is still one of America's best-loved poets. 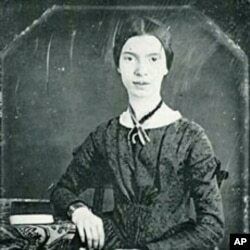 And now we remember a great American poet, Emily Dickinson. She was born in Amherst, Massachusetts on December 10th, 1830. Only a small amount of her work was published during her lifetime. Most of her poems were recovered after Emily Dickinson’s death in 1886. She had written the poems on small pieces of paper or on the backs of envelopes. They were published over many years. Poems are nice, because they rhyme. But here we are, once again, out of time.